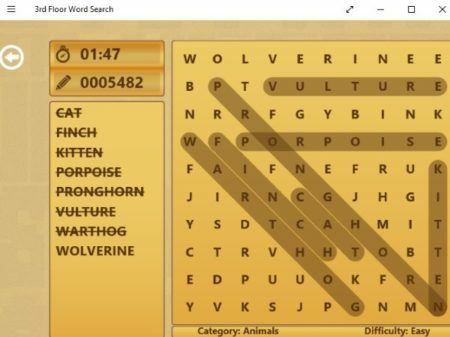 This article covers 10 free Word Search games for Windows 10. Word Search games are always fun to play whether you are a kid or adult. In word search games you will get a grid with jumbled up alphabets/ letters. Along side the grid, you will be given some words which you need to find in the word grid. The words can be found vertically, horizontally, or even diagonally. For kids these games give you small and simple words. Whereas, for adults the words get more complicated. But none the less they are all quite exciting to play. Most of the games also have nice graphics and background sound, which makes the games even more fun. 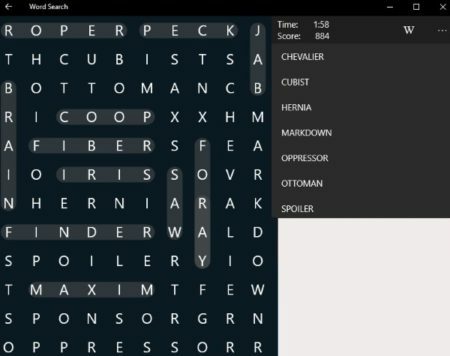 Let’s look at these free Word Search games for Windows 10 below. Word Search Ultimate! 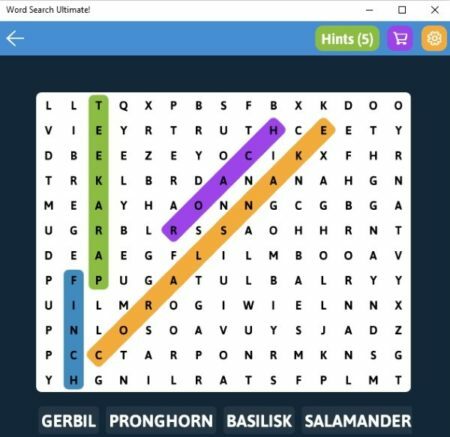 is a nice word search game app for Windows 10. In this game app, you will get lots of categories that you can choose from at the beginning of the game. You will find categories like animals, art, astronomy, beach, birds, boats, body, cars, colors, countries, flowers, food, Halloween, languages, math, music, plants, trees, sports, etc. Each of these categories will have relevant words to the category name. Like I chose animals, so I got the word grid which you can see in the above screenshot. In this game, there are words shown at the bottom of the grid. Now you have to find these words in the word grid. You can mark words vertically, horizontally, or diagonally. When you find a word, it will disappear from the board making place for a new one. At the top of the game window is a hints icon, which can be used when you are stuck and can’t find a word. The hint will highlight the first word from the list. Similarly, you can try out other categories as well. Word Search – Puzzles is a nice word search game. When you start this app you will see the interface like the one shown in the screenshot above. The word puzzle starts with the game itself. As you can see the list of words to be found is displayed on the left side of the app window. The words can be found forward or backward, vertically, diagonally or horizontally. The top bar shows the total number of words and the number of words that you have found so far. Along side you will see a timer running, which will show you how much time you took to complete the game. Also, there is a option to change the game font and language. Simple Word Search has a nice interface as can be seen in the screenshot above. When you start this game app, you will be shown a screen with 2-3 buttons on it. One is for starting a new game. Another one is for settings. In settings you can turn the timer and sound options on or off. You can also select if you want to highlight words in color or in gray scale format. There is also a button for daily puzzles. A new puzzle is add on the app everyday and there is a separate button to play that game. To start a game click on the new game button and you will get a screen like the one seen in the above screenshot. Here you have a word grid on the right and word to be found on the left. The total number of words is also shown at the top of the word list. A timer will also keep running on the top left side to let you know how much time you took to find all the words. The words you find will be highlighted in different colors. 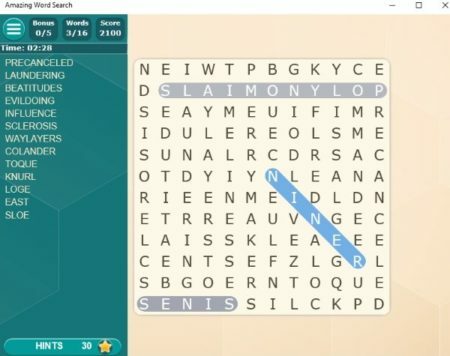 Word Search Epic starts with the game window which can be seen in the screenshot above. The words to be found are given at the bottom of the window and the word grid is given in the center of the screen. The words that you find will be highlighted in one color only. The paint icon you see at the top right corner is for changing the app theme between light and dark. The settings icon on the top left will bring up a menu bar at the top of the game window. 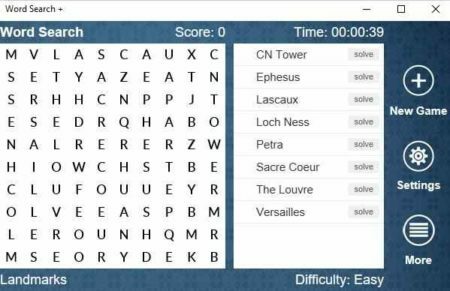 From this menu bar you can see all the puzzle categories available, create custom word search puzzles, or change some options like turning on timer, notifications, etc. Word Search starts with a screen with option to check out settings where you can change the game mode between easy or difficult and change the background color between back or white. There is also a button to view your high scores. We will start with clicking the start button. A game will open up as shown in the screenshot above. As soon as the game open the timer at the top starts running. The words that you have to find are given on the right side and the word grid is given on the left side. You score for the game is displayed below the timer as well. 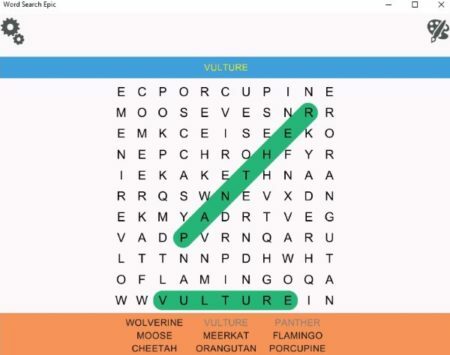 Word Search + is a nice game app. When you start this app you will see an interface like the one shown in the screenshot above. The word grid is given on the left side and the words to be found are given on the right. 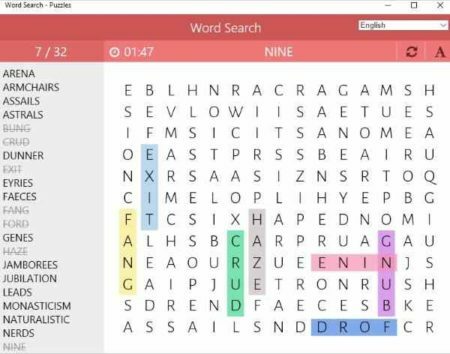 The difficulty level is shown at the bottom of the window along with the topic of this word search game. Like in the above screenshot the topic is landmarks and the words to be found correspond with the topic. You can see your score and a timer on top of the window. On right side there are options to start a new game and settings. The settings option lets you change the appearance of the app in terms of fonts and background. You can also turn the background sound on or off and choose between color highlights or red & green highlights. Word Search – Free is a nice word search game app. In this game you can select a category for your game before you start playing. There are lots of categories available to choose from like books, geography, sports, science, movies, celebrities, TV, kids, animals, general, etc. Once you have chosen a category, the word grid will come in front of you. This can also be seen in the screenshot above. The words to be found are given on the right side. These words are related to the category you chose. 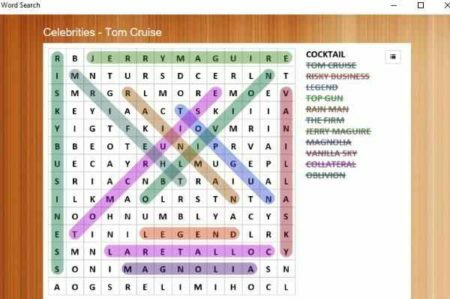 For example, I chose Tom Cruise, hence all words are related to movies he was in. The words will be marked with different colors. You can mark words vertically, horizontally, diagonally, etc. 3rd Floor Word Search has a nice interface. In this game app, you will come across various categories to choose from before you start playing. This can be seen in the screenshot above. First of all you can choose a level of difficulty from easy, medium, hard, and expert. Then you can choose a game mode from classic, first letter only, keep it going, and free play. Now you can choose a category to play with from the given ones. These categories have further sub categories as well. Once chosen the game screen will come in front of you as can be seen in the screenshot below. On this screen, you will see the word grid on the right side and words to be found on the left side. 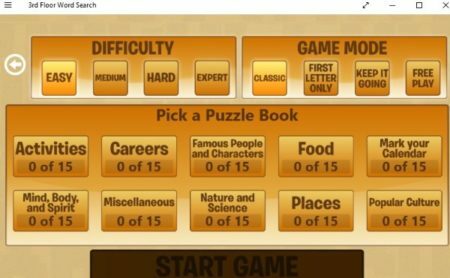 There is a timer running at the top left side, to keep check of time taken to solve the puzzle. The category and difficulty level are displayed at the bottom of the word grid as well. Now the words that you find will be highlighted in the grid with one color only. You can find the words horizontally, vertically, diagonally, etc. Amazing Word Search is a nice word search game for Windows 10. In this game app, you will see a game screen like the one shown in the screenshot above. The word grid is on the right and the words to be found are on the left. At the bottom left of the screen is a hints option, which you can use if you are stuck and cannot find a word. You will also find a timer running at the top, to see how much time you take to solve the game. The burger icon will bring up a menu from where you can change the theme of the app. You have various themes to choose from like classic, monochrome, pinky flowers, old blue lines, mint circles, and redish diamonds. You can also turn the hard mode on or off from here. Word Search Game Deluxe is a nice word search game app. In this app you will be asked to select a category as soon as you start the app. There are lots of categories to choose from like animals, movies, astronomy, cartoons, sports, star wars, video games, presidents, etc. After choosing a category the game screen will come in front of you as seen in the screenshot above. The word related to the category you choose will be seen on the right side and the left side of the screen will have the word grid. Start searching for words and all the searched words are highlighted in orange color. The words give on the right will be striked out when you have found them on the grid. Each word also has a solve link in front of them. In case you are not able to find a word, then use the solve link to find that word. You can also see the timer at the top of the page. 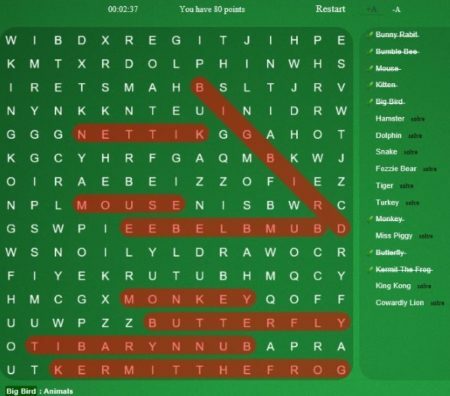 These are 10 free Windows 10 word search game apps. You can try out any of these and enjoy playing this game. Word search games are quiet popular and fun to play. They help in improving your vocabulary and focus skills. Do try these apps out.